This month, the Royal New Zealand Ballet will embark on the ultimate ‘tiki tour’, performing at a whopping 47 venues across the country. Tutus on Tour will cover so many towns, that the company will split into two touring parties. The mixed bill includes excerpts from Flower Festival at Genzano, FrENZy, Through to You by New Zealand choreographer Andrew Simmons, Little Improvisations and the crowd-pleasing Don Quixote pas de deux. 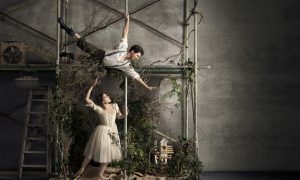 Topping it off is a brand new version of Prokofiev’s Peter and the Wolf, choreographed by RNZB dancers-turned-choreographers Brendan Bradshaw and Catherine Eddy and narrated by New Zealand comedian and television personality Te Radar. RNZB Artistic Director Ethan Stiefel says “The 2013 edition of TOWER Tutus on Tour includes a few ‘blasts from the past’ as well as some RNZB premieres. If any ballet program could define the phrase ‘something for everyone’, this show just might get as close as one can get.” Tutus on Tour runs from October 23 to December 5. New Zealand School of Dance students Law Lok Huen (Tirion) and Stefaan Morrow. in ‘First Light. Photo by Alex Efimoff. The Caroline Plummer Fellowship in Community Dance for 2014 has been awarded to Louise Potiki Bryant. As an award winning Maori choreographer, Louise has created works for Atamira Dance Company, Curve and Black Grace, amongst others. Louise grew up in Dunedin, obtained a degree in Maori Studies from the University of Otago, a degree in Performing and Screen Arts from Auckland’s Unitec, and in 2003 she was Ngai Tahu Artist In Residence at Otago Polytechnic. New Zealand School of Dance students Law Lok Huen (Tirion) and Stefaan Morrow performed as guest artists at the Asian Grand Prix in Hong Kong recently. They accompanied the School’s director Garry Trinder who is president of the jury for the competition and was formerly artistic director of the Hong Kong Ballet. Tirion was born in Hong Kong and won the Asian Grand Prix in 2012, so it was fitting that she return to the competition as a guest. In the concluding gala of the competition, the two performed the duet First Light, choreographed by NZSD graduate and member of the Royal New Zealand Ballet, Loughlan Prior. Photo (top): Royal New Zealand Ballet dancers in Tutus on Tour.